A powerful blend of all natural enzymes and potent antioxidant herbs. This proprietary formula is carefully blended to help maintain or restore maximum health by supporting a healthy immune system, reducing free radical damage and inhibiting pathogens. 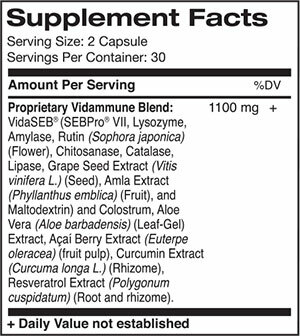 Taking Vidammune regularly supports the body’s natural healing ability, and promotes healthy immune system response.